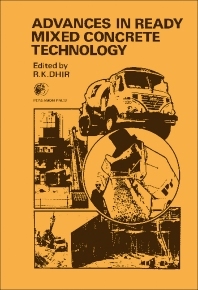 Advances in Ready Mixed Concrete Technology contains the proceedings of the first International Conference on Ready-Mixed Concrete held at Dundee University in Scotland from September 29 to October 1, 1975. Contributors focus on the significant progress that has been made in ready mixed concrete technology. Some practices are highlighted along with possible areas for research. This text is organized around seven themes; the first of which deals with plant and equipment. Production methods and their development in the ready mixed concrete industry are reviewed, along with developments in batching plant and equipment to meet the needs of the ready mixed concrete industry. The chapters that follow explore the materials used in making concrete, properties of fresh and hardened concrete, mix design and quality control, and transportation and placing. The final section discusses the economics of ready mixed concrete, with emphasis on the cost of placing concrete by pump and the relative economics of alternative materials in Portland cement concrete. This book will be of interest to ready mixed concrete producers, their customers in the construction industry, and their suppliers of concrete materials, plant, and equipment. How Soon is Soon Enough? industry (1989 and 1990 consecutively) and honorary fellowships from the Institute of Concrete Technology, United Kingdom; Indian Concrete Institute. He served on numerous technical committees, including as president of the Concrete Society (2009-2010) and on the editorial board of the Magazine of Concrete Research.